In a new paper “Social Innovations for Economic Degrowth” for the renowned US journal “The Solutions”, Andreas Exner and Christian Lauk explain why money and markets necessarily lead to economic growth. They show which social innovations already are in place to overcome the growth impasse. Peak oil will make degrowth highly desirable, and a shrinkage of economic output very probable. This is recognized by many, but seldomly, the question is answered, how degrowth is possible. This reorientation is practised in solidarity economies and the commons. It allows workers to orient themselves toward concrete needs, which can be satisfied, unlike profit production, and to reshape production, sorting out what is not needed or even harmful. A degrowth economy thus conceived would be highly resilient, firstly, because it would minimize vulnerability toward peak oil, secondly, because it would be based on reciprocity, trust and cohesion, making it flexible, innovative and adaptive. 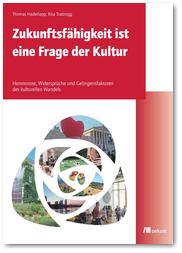 Andreas Exner is engaged in the project this weblog presents, Christian Lauk works at the Institute for Social Ecology (IFF) at the University of Klagenfurt (Austria). In february 2013, their new book “Land and Resource Scarcities. Capitalism, Struggle, and Well-Being in a World without Fossil Fuels” will appear at Routledge.